I finished K’s socks! Yea! Here’s a pic after washing. Click for the bigger version. 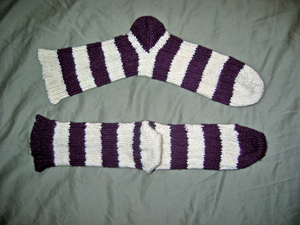 Yes, the alpaca socks are finally finished, which leaves me free to start the sock scarf. I can’t wait! The colors in the pic aren’t great, but at least you can get the idea. The light color is an off-white, sort of cream color. The dark color is a very dark purple. I was kind of in a hurry to get out the door so I could deliver them, so I just tossed them down on top of my dark, gray-green sheets. Probably not the best choice for backdrop. K has promised to report back how they feel. Hopefully they will keep her feet warm without setting off her neuropathy. I kept the bind-off really, really loose and the slight rib should provide snugness without being too tight, so I’m keeping my fingers crossed that there’s no tightness or rough spots. Now on to the scarf!